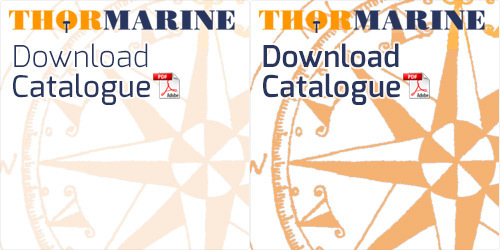 THORMARINE is European stock holder and distributor for BAIER Marine of America. Baier is the first name associated with commercial marine flush deck hatches, having set the standard for the industry since 1947 when Baier was awarded its first patent for innovative design. Baier was the first flush deck marine hatch manufacturer to receive American Bureau of Shipping (ABS) and US Coast Guard certification. Today, Baier Flush Deck hatches are employed on all types of fishing boats, tugs, barges, rescue boats, and other marine vessels in both military and private sectors. All Baier Marine hatches are available with steel or aluminum flush deck ring, suitable to weld. The new hidden hinge has main advantages to existing on deck systems. Please check catalogue for technical drawings, or ask our sales department for detailed information. Catalogue can be downloaded here. Ultra-Low profile – Only 2.62″ (66.7 mm) – The thinnest waterproof removable hatch ever! Baier low profile hatches are designed for applications where inside clearance is limited. Built strong for the extreme rugged requirements of the commercial and fast utility craft worldwide. This hatch also features the exclusive Quick Acting opening closure system, the whole hinge is located below the deck, making it maintenance free. Please contact us via email or telephone for more information on prices and delivery times.